Roger Senn of Poteet, Texas, came from behind to win his first Poison Lone Star Billiards Tour, amateur 9-ball division title, defeating Rudy Sanchez in the finals 5-2, 5-4. 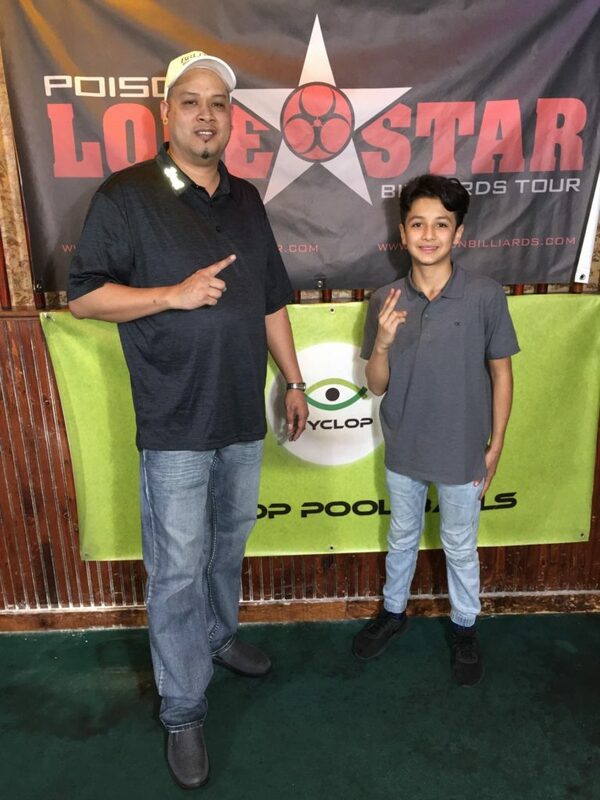 Houston’s Ernesto Bayaua went undefeated in the open 9-ball division, sliding by twelve year-old Lazaro Martinez, III, aka “Little Laz”, 6-5, snapping off his first win of the 2019 Tour season. 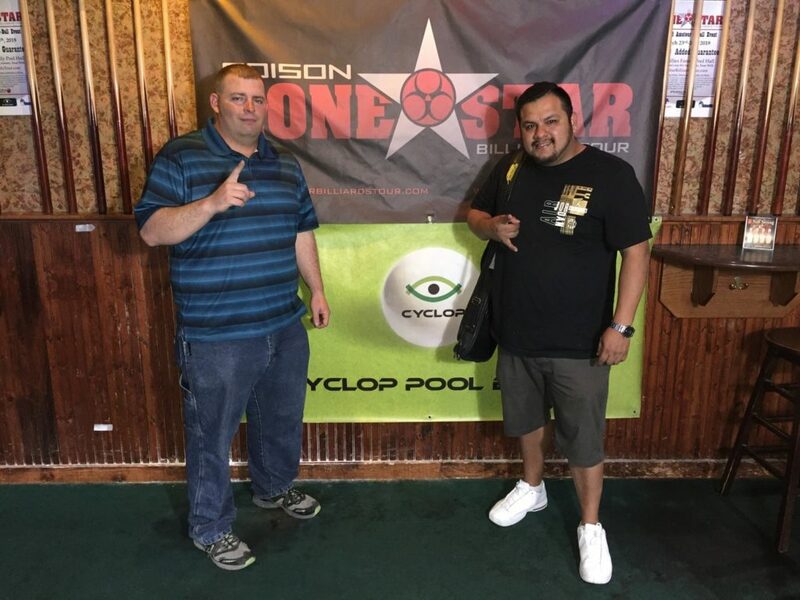 On March 23rd-24th, 2019, Tour title sponsor, Poison by Predator Cues, sponsors Cyclop Pool Balls, APA of North Harris County, Vapor Knights U.S.A., and Outsville Billiards, facilitated another successful Poison Lone Star Billiards Tour event, amassing sixty-four players in each division, for a total of eighty-five competitors, paying out a cool $10,380. This marked the Tour’s first event at Slick Willies Family Pool Hall in San Antonio, located at 6436 NW Loop 410, just seven miles from Sea World. The Tour would like to thank Slick Willies’ Director of Operations, David Kimmey, for making this happen, along with his entire staff, for hosting a first-rate event. This was the third stop of the year, and the second stop hosted by the Slick Willies Corporation. The next event of the 2019 Tour season is April 27th-28th, at Slick Willies Family Pool Hall, 5913 Westheimer Road, in Houston, Texas. In the amateur 9-ball division, on his way to the winners’ side final four, newcomer Roger Senn defeated Jason Guerrero, Tony Cuellar, 5-4, Joey Bourgeois, Jr., 5-2, and Chris Castillo, 5-0, while San Antonio’s D.G. Gonzalez decimated Louis Olivo, Patrick “Pat” Perez, Ricardo Espinosa, 5-2, and Buddy Chilton, 5-2. Rudy Sanchez took no prisoners, ousting Michael Lopez, 5-3, Heath Mendenhall, Albert Luna, 5-3, and Henry Rocha, 5-2, while Lazaro “Little Laz” Martinez, III, tagged Devin Higgins, 5-1, Justin Hubacek, Jason Dutchover, and Joel Acevedo, 5-4. Rounding out the final eight on the one-loss side, Luna was eliminated by Reece, 5-2, while Wayne Senn sent Brian Ripoli packing, 5-2. It was Benito Cazares over Bourgeois, Jr., 5-3, and Mike Espinosa over Rocha, 5-4. Reece went on to eliminate Chilton, and W. Senn took care of Chris Castillo, by the same score, 5-1. Cazares fell to Acevedo, and M. Espinosa ended Rocha, 5-2. As the west side progressed, the winners’ side final four matches were underway. Rudy Sanchez overcame Martinez, III, 5-3, while R. Senn denied Gonzalez, 5-3. In the hot seat match, Sanchez squeezed by R. Senn to secure his position, 5-4. Back on the one-loss side, and in the final eight, Reece stopped W. Senn, 5-4, while Rocha overwhelmed Acevedo, 5-0. W. Senn fell to Martinez, III, 5-4, and Rocha eliminated Gonzalez, 5-3. Rocha forged ahead, ending Little Laz, 5-1, falling in turn to R. Senn, 5-4. The rematch between Sanchez and R. Senn was a fight to the final game, one not soon to be forgotten by the San Antonio sweaters. In the first set, R. Senn came on strong, and Sanchez felt the heat. Sanchez lost the first set, 5-2, but the fight was far from over. At 5-3, Sanchez’ favor, R. Senn answered back, winning the next two games, closing out the second set, 5-4. Congratulations to Roger Senn on earning his first, Poison Lone Star Billiards Tour title! In the open 9-ball division, Ernesto Bayaua made his way to the winners’ side final four with victories over Vance Rodriguez, Glenn Mitchell, 6-3, Eric Aicinena, 6-2, and Roger Senn, 6-1, while Lufkin’s Chad Reece took down Christopher Ayers, Gabriel Martinez, 6-4, Dennis Hadley, 6-2, and Ricardo Espinosa, 6-4. Lazaro Martinez, III, aka “Little Laz”, derailed Colton Berzins, Lazaro Martinez, Jr., Albert Luna, 6-3, and Rouque Garza, 6-3, while Tony Cuellar defeated Joey Barajas, 6-2, Dustin Lockingen, 6-5, Wayne Senn, 6-3, and Ruel Serna, 6-5. On the one-loss side and in the money, Glen Mitchell eliminated Danny Reid, 6-5, and Ricardo Espinosa, 6-3. W. Senn took out Ruben Castillo, 6-5, but fell to R. Senn, 6-3. Aicinena was on a roll, ending Chuck Adams and Ruel Serna by the same score, 6-2, while first-timer Joshua Garcia ousted David Ortega, 6-3, and Rouque Garza, 6-5. Back on the east side, Little Laz sent T. Cuellar packing, 6-3, while Bayaua overwhelmed Reece, 6-2. 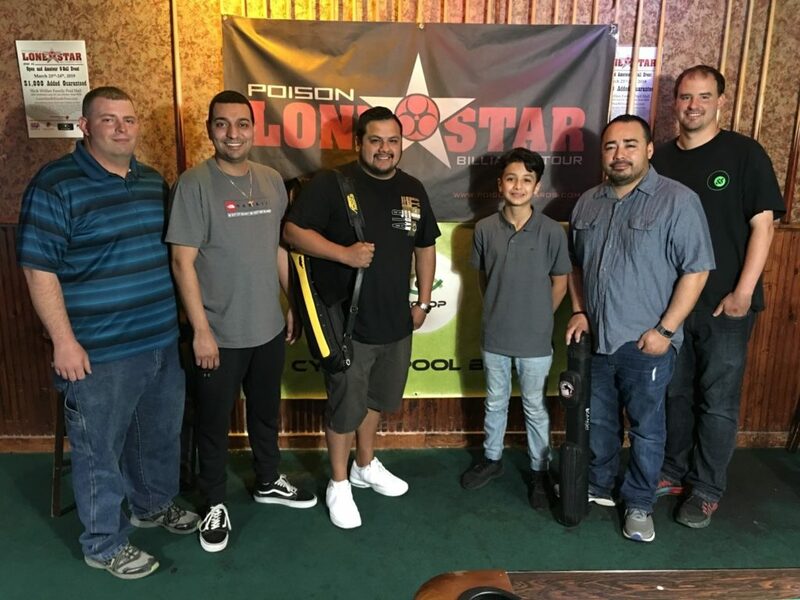 Twelve-year old pool phenom, Little Laz, reached his first-ever, hot seat match, on the Poison Lone Star Billiards Tour. While he displayed tremendous heart, Bayau commanded the lead, and ran away the set, 6-1. On the west side, R. Senn ended R. Espinosa, and T. Cuellar, 6-5, while Aicinena devoured Garcia, 6-2, and Reece, 6-0. R. Senn went on to eliminate Aicinena, but fell to Little Laz, 6-3. Once again, it was young gun versus veteran, and this time, it was in a true, double elimination final. The final set was a real crowd pleaser, as players volleyed to the finish line. At 6-6, Little Laz scratched on a six-ball, and Bayaua ended the match. 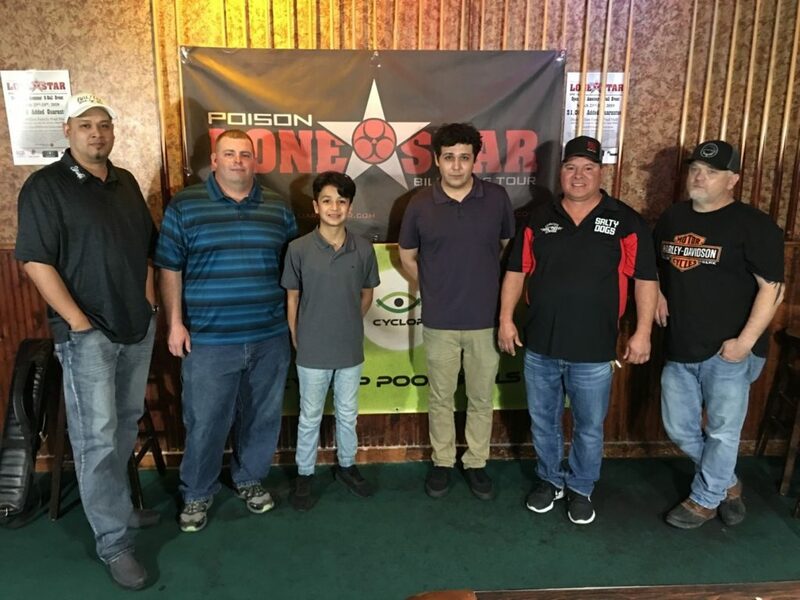 Congratulations to Ernesto Bayaua on his first win of the season, and to Lazaro Martinez, III, on becoming the highest finishing, junior player, in the history of the Poison Lone Star Billiards Tour! Congratulations to Terri Urban who took home a Poison by Predator, Arsenic3-6 playing cue, and Gilbert Castillo, who scored a set of “Zeus” Cylcop Pool Balls, in the event raffles. The Tour would like to extend its deepest gratitude to all the competitors in San Antonio who came out to support this event, and those who traveled great distances to attend. Julia Acevedo was in charge of raffle tickets sales, and assisted with tournament direction throughout the entire weekend. Her efforts are always greatly appreciated. The next event of the 2019 Tour season is April 27th-28th, at Slick Willies Family Pool Hall, 5913 Westheimer Road, in Houston, Texas. For more information about the Poison Lone Star Tour, visit www.LoneStarBilliardsTour.com.